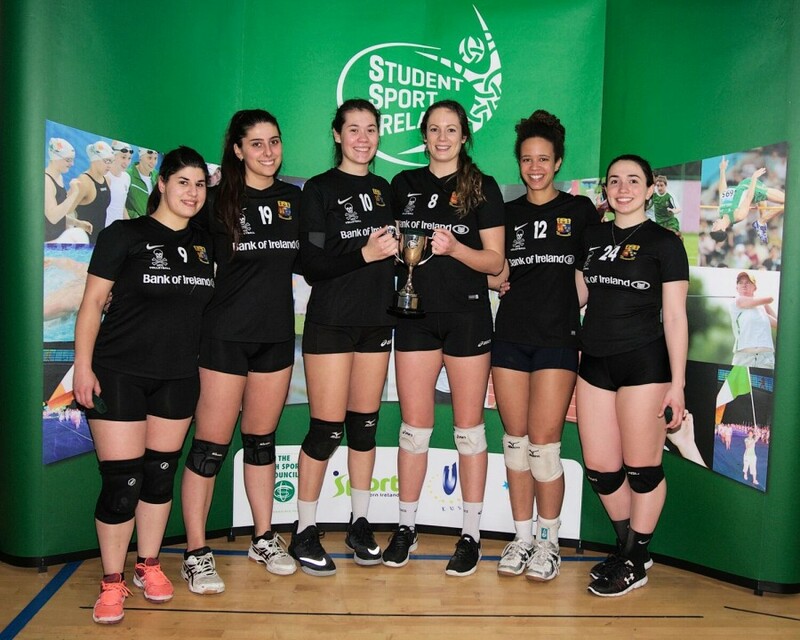 The 2018 Student Sport Ireland Volleyball finals took place in Maynooth University on Wednesday 14th March. It proved to be a very successful day for University College Cork (UCC) as they took home both the Men’s and Women’s titles. There was plenty of high quality action on display throughout the day as the semi-finals of both competitions also took place. In the Women’s competition it was UCC who stole the show. They were flawless in their semi-final and the final winning both without dropping a set. UCC came up against a spirited RCSI in the final but they could not stop the girls from Cork winning the first set 25-14. In the second set RCSI to their credit started extremely well but eventually UCC took control and in the end they clinched the title with a 25-10 victory. In their semi-final UCC overcame the challenge of Trinity while RCSI played out an enthralling encounter with the hosts Maynooth. All three sets were won by the minimum margin with Maynooth winning the first 27-25. RCSI took the second 26-24 and in the final set they just got the better of Maynooth winning 17-15. UCC Women’s Panel: Kelsey Robinson, Claire Denley, Kelly Gallagher, Mathilde Blanco, Aylin Sahin, Alexandra Balthazard. RCSI Women’s Panel: Traveen Singh, Karishma Singh, Riho Taguchi, Colleen Wong, Hsiao-Chi Huang, Calista Marshall, Calista Marshall, Erica Lai, Fraser Jang-Milligan, Samantha Tso, Karina Burke, Taylor Offman. 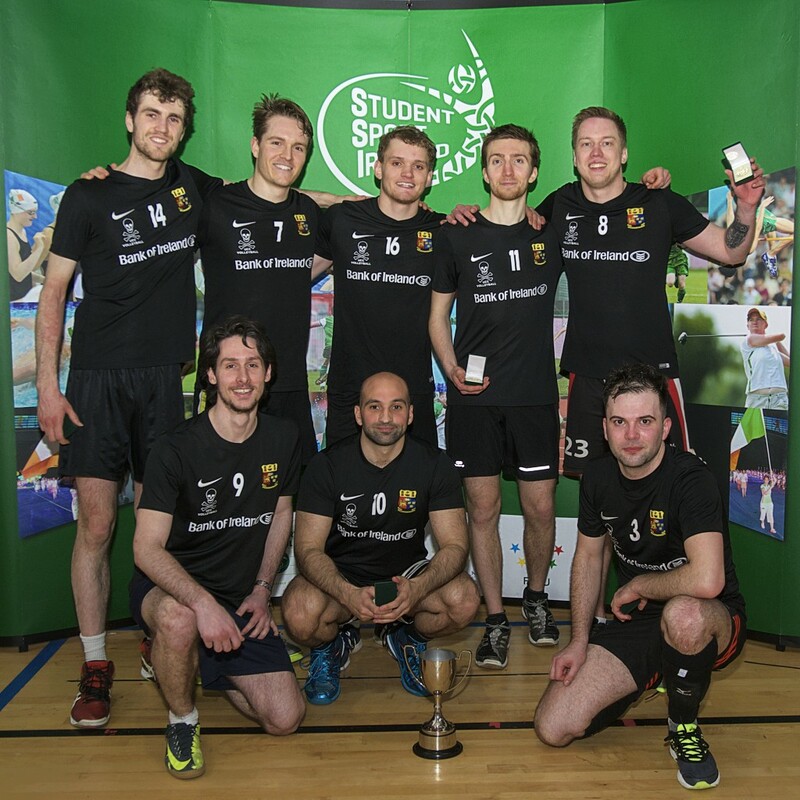 UCC Men’s team won a first ever title for their college by defeating the reigning champions University College Dublin (UCD) in a trilling final. UCD took the first set 25-21 and looked to have had the edge over their Cork rivals. However UCC fought back and claimed the second set 25-18. In an absorbing final set the momentum swung on numerous occasions between the two sides. In a final that could have easily gone either way it was UCC who grabbed their chance and won on a score line of 18-16. The UCC Men’s victory completed an historic double for the Cork College. UCD can be very proud of their efforts and of how they contributed to a great final. Earlier in the day UCD came through an extremely tough semi-final against Trinity College Dublin. It also went to a deciding set with UCD winning by the narrowest of margins 16-14. UCC progressed from the semi-final stage where Athlone Institute of Technology (AIT) were their opponents. UCC Men’s Panel: James Meeke, Cedric Berthomme, Riccardo Orizio, Darek Sokol-Randel, Mohamad Dernaika, Andrei Sorin Bolocan, Nicholas Bradley, Janis Agurjanovs. UCD Men’s Panel: Eduardo Morais, James Leahy, Clement Calviho, Matteo Bonomo, Rickie Wong, Mateusz Olszewski, Rafal Koziel. Student Sport Ireland would like to thank all of the players and coaches who competed in an extremely sporting event. A special thanks also to Maynooth University for hosting the event and to the volunteers and officials for delivering a brilliant day of Volleyball action.